When it comes to homeownership, you have lofty goals - and you should! Let us help you achieve your home financing goals. What is a Jumbo Refinance Loan? If you have a jumbo loan and are considering a refinance, we have many options for you. A jumbo refinance loan is a refinanced loan that exceeds a specific threshold called the conforming loan limit. Currently, the conforming loan limit for a single-family home is $453,100. However, loam limits can go higher in some high cost area of the continental United States. How Do I Know if I'm Eligible for a Jumbo Refinance Loan? 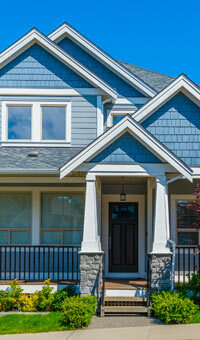 The same factors that qualify you for any home loan also apply for a Jumbo refinance loan. However, in comparison to a standard conforming home refinance loan, a Jumbo loan may require higher credit scores, lower debt-to-income ratios, higher reserves, and larger down payments. What are the Benefits of a Jumbo Refinance Loan? Let the experienced professionals at Waterstone Mortgage guide you throughout the entire Jumbo refinance loan process. With our expertise and attention to detail, we'll work with you from application to closing to make your homeownership dreams a reality. Been paying the same mortgage payment amount each month for years? Our Refinance Calculator can help you determine what your new monthly payment might be.